The United Nations Office for Disaster Risk (UNISDR), with support from the European Commission is engaging 20 cities worldwide in an initiative entitled “Making cities sustainable and resilient: Implementing the Sendai Framework for Disaster Risk Reduction 2015-2030 at the local level”. The initiative builds on the achievements of the participating cities in building resilience, and paves the way toward the implementation of the Sendai Framework for DRR 2015-2030. The overall objective of this action is to build more sustainable and resilient cities, by strengthening the capacity of key public, private and civil society stakeholders to assess and address risk to ensure that public and private investments are risk-informed and that early interventions in crisis-prone cities are linked to longer-term development. Nablus City, is one of the four cities selected in the Arab region. The project will provide the cities with in-depth risk assessment using the disaster resilience scorecard with the purposes of identifying and understanding current and future risks, as well as challenges and gaps in DRR at the local level. In addition, the project will provide the cities with local disaster loss databases which collate information for over a period of at least 30 years. Most importantly, the project will support the local governments in the development and adoption of local resilience action plans. 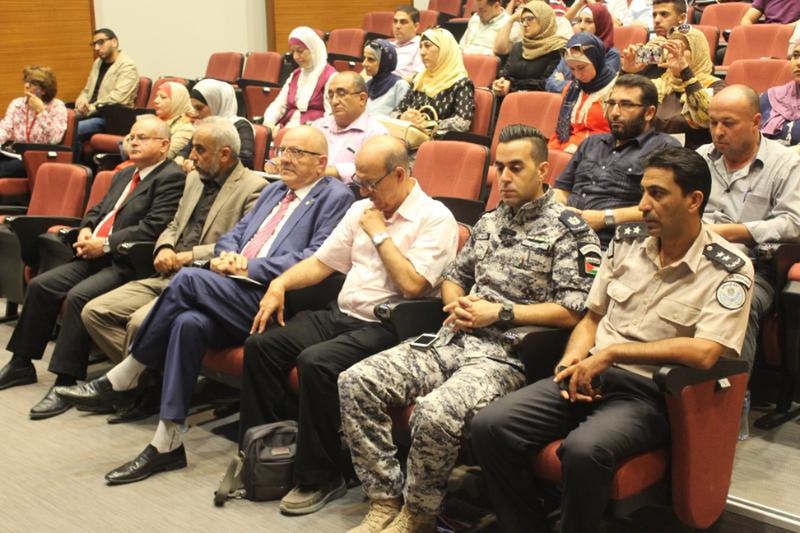 The workshop was attended by representatives of different governmental and non-governmental organizations, private sector, some municipalities in Nablus governorate in addition to the local media which covered the event. -Palestinian ministries of: Education, local government, public works and housing, health, interior affairs, finance, information, civil defense and environmental quality authority. 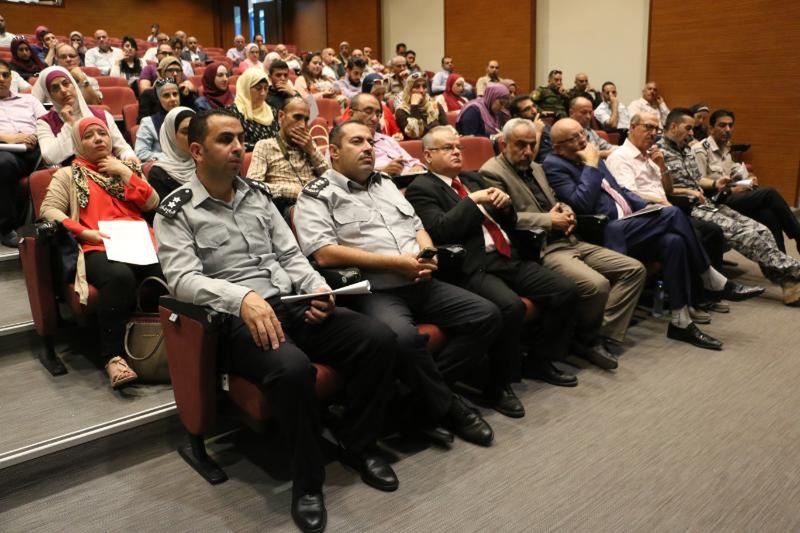 - Representatives from Nablus Municipality, Najah University and other municipalities from Nablus governorate. - Representatives from governmental and local and international non-governmental organizations and the private sectors. - Representatives from the practitioner engineering firms. - University professors as well as students. Professor Maher Natshah, acting university president, welcomed attendants and emphasized on the university commitment towards supporting such initiatives in cooperation with all concerned in the local community through the university experts and resources. He highlighted the good evaluation of the university locally and regionally as a result of the contribution. He also appreciated the support submitted by the international organizations like the UNISDR. 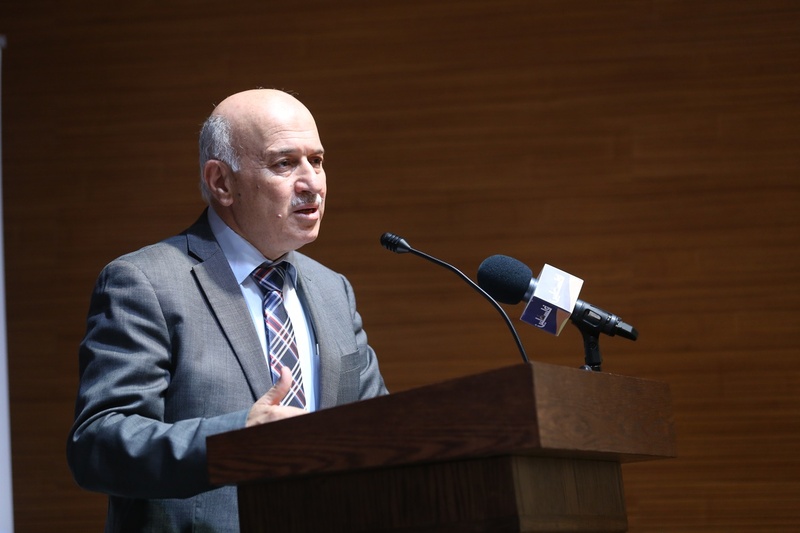 The Mayor, Engineer Adli Yaish, expressed his appreciation to the efforts done by the university through the experts and the scientific centers. He mentioned also that Nablus city is susceptible to both natural and man-made disasters and there are many evidences of these disasters. He also referred to the preparation of the strategic development and investment plan that takes into consideration activities connected to Disaster Risk Reduction. And the city has previous good experience connected to response to disasters, but requires more support to build the capacities and the economics. 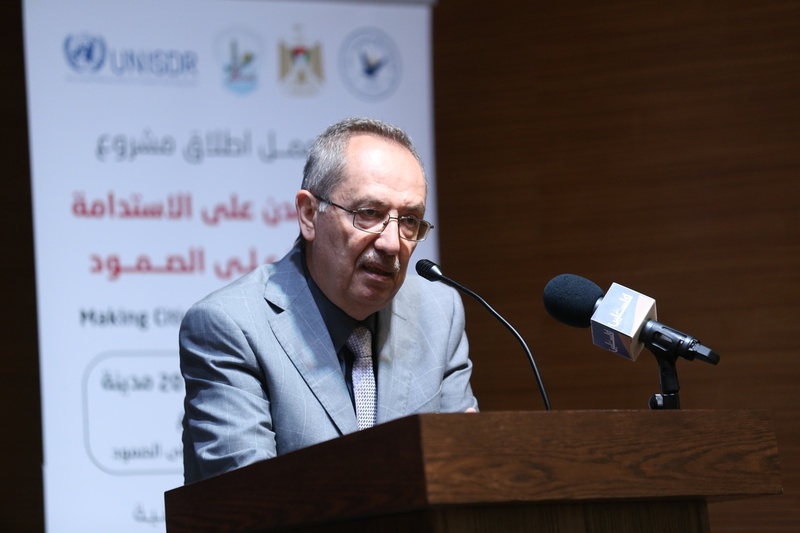 Professor Jalal Al Dabbeek, the coordinator of the University Scientific Centers and project coordinator presented a briefing about the project and the initiative of UNISDR who chose 20 cities worldwide to implement the project. The reason behind the selection of Nablus that is connected to the fact that the city is susceptible to different types of Hazards. The history has different evidences of the hazards that were both natural and man-made. Also, success stories can be presented about the performance of the city community in response to different hazards in the past. The governor Mr. Akram Rjoub, confirmed on the importance of such activities to the city. The need from all concerned local community as well as the government institutions to play their role and the unlimited support from the governorate to achieve that. - Nablus city status in terms of level of vulnerability as a result of natural and human disasters. In addition to the daily stresses imposed on the city and the consequences. - Briefing about Sendia Framework for Disaster Risk Reduction 2015-2030 with an explanation about the ten Essentials of Sendia framework and the International Campaign on Disaster Risk Reduction. 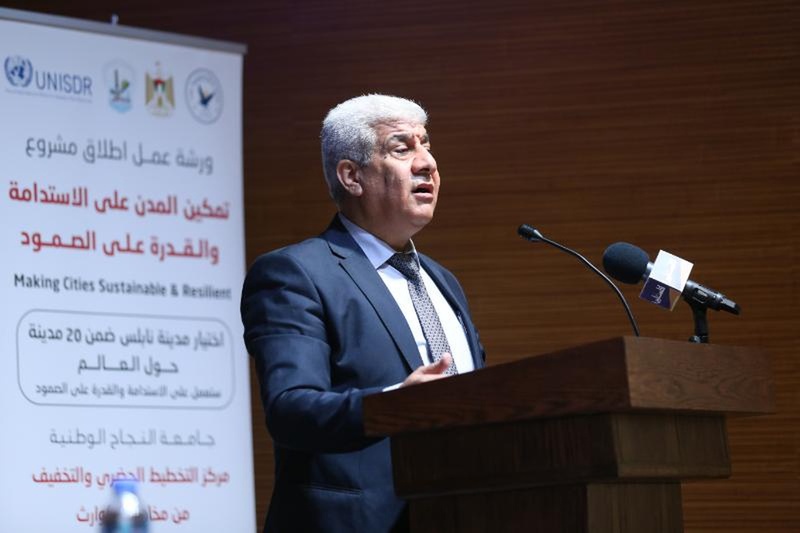 - Reference and briefing on the disaster resilience score card and its connection with the Sendia ten Essentials which will be used as a major part of the project in coordination and cooperation with the different concerned institutions. - Other information about the project contents and objectives of UNISDR initiative. - The importance of working collectively on the initiative to get the best results. 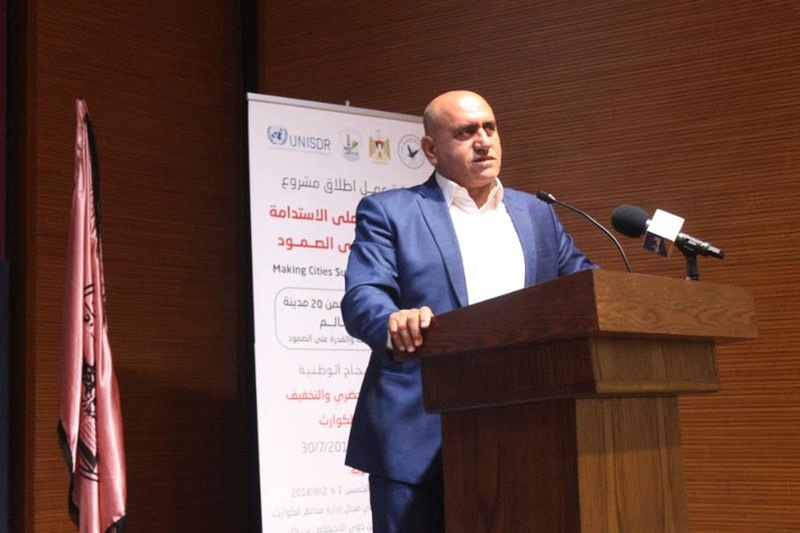 - Nablus city Engineer Sameh Assi, presented a briefing on the Municipal Laws connected to building permits, and the classification of these buildings, within Nablus Municipality boundaries. - Dr. Amal Hudhud, who is the municipality coordinator of the project, referred to the recently prepared Strategic Development and Investment Plan SDIP of Nablus which was prepared adopting a participatory approach with almost all communities and city stakeholders taking into consideration proposed projects that will help towards disaster risk reduction. - Prof. Jalal referred to the building systems in the city and the heights with the connection to the streets widths and the need to reconsider the rules and regulations building on his previous experience as a major and active member of the Municipality Advisory Committee who worked on the building laws and guidelines. - Engineer Abdalhakeem confirmed on the need to think holistically about everything connected to possible disasters and not of the problems associated with buildings only. · The need to improve and integrate the private sector in the DRR. · The need to reconsider the building licenses guidelines and strict implementation. · The need for more efficient coordination and cooperation between all concerned institutions, governmental departments and all local community organizations in the city in order to reach a common program that all stakeholders work and agree on it. · The importance of solving problems created as a result of some people’s building without following the guidelines. · The need to empower the role of the Higher Council for Civil Defenses. · The need to pay attention to buildings outside the city in ruler areas surrounding the city boundaries. · The importance to improve the quality of the engineering work and maintain it. · The importance to have the correct information from a reliable source. · The importance to have a code of practice for Palestine. Meanwhile, using the Jordanian code practice which was a decision from the cabinet. · The need to avoid the fatal mistakes and errors in terms of seismic design requirements for buildings. · The importance of using Sendia framework items integrating the correct information which will lead to identify the real status of the city, proposing programs to move forward and these programs will include projects. Eventually improve the level of preparedness towards resilient Nablus. Finally, the workshop was finalized and all organization were urged to attend the planned training workshops on 1 and 2 August, 2018.